Fairy shrimp is the common name for aquatic crustaceans in the branchiopod order Anostraca, characterized by elongated bodies, paired compound eyes on stalks, absence of a carapace, and an upside down swimming motion. Brine shrimp is the common name for some members of Anostraca. Most of the species of Anostraca reach two centimeters (.8 inches) in length, with a few freshwater forms reach ten centimeters (3.9 inches) in length as adults (Russell-Hunter 1969). Anostraca includes genera adapted to living in concentrated brine (Artemia), brackish water (Branchipus), and fresh water (Chirocephalus and other genera) (Russell-Hunter 1969). Fairy shrimp provide a number of ecological, commercial, and nutritional values. Ecologically, they provide food for fish and birds. Commercially, the Artemia genus is of particular importance, with the cysts collected, processed, and sold as fish food, both for aquariums and for industrial aquaculture to feed fish larvae (Dumont 2004). Some species of Anostraca also serve as food for people. Communities living around saline, spring-fed dune lakes in the Libyan Fezzan desert use Artemia as their chief animal protein source, while a species of Streptocephalus and one of Branchinella in northeastern Thailand are used in various local dishes. Fairy shrimp belong to the diverse group of aquatic, primarily freshwater crustaceans known as Branchiopoda. The taxonomic group Crustacea generally is assigned at the level of subphylum or superclass, but also has been considered a phylum or class in some taxonomic schemes. Thus, while Branchiopoda generally is considered as an class within Crustacea, in taxonomic schemes that consider the Crustacea to be a class, Branchiopoda generally is considered to be a order. As with other crustaceans—crabs, lobsters, shrimps, copepods, and so forth—fairy shrimp are characterized by having branched (biramous) appendages, two pairs of antennae that extend in front of the mouth, and paired appendages that act like jaws, with three pairs of biting mouthparts. Crustaceans also are typified by three distinct body parts: head, thorax, and abdomen (or pleon), one pair of compound eyes, and a tail that ends with a telson (last division of the body of a crustacean, but not a true segment). Fairy shrimp share with other arthropods the possession of a segmented body, a pair of jointed appendages on each segment, and a hard exoskeleton that must be periodically shed for growth. As branchiopods, fairy shrimp are characterized by paired compound eyes and a single simple eye, as well as leaflike or phyllopodous appendages (Follo and Fautin 2001). Fairy shrimp comprise the taxonomic group Anostraca, which is typically an order placed within the subclass Sarsostraca of the class Branchiopoda. Fairy shrimp lack a carapace (hard shell). The name Anostraca comes from Greek words for "without" and "piece of hard tile" (Dumont 2004). The thoracic limbs of fairy shrimp are leaflike and flattened, without true joints, and a peculiar feature of all members of Anostraca is that they swim upside down (Dumont 2004). Most fairy shrimp range in size between one centimeter (0.39 inches) in length and three centimeters (1.1.8 inches) in length (Dumont 2004). Some species, such as Branchinecta gigas, have adults that grow up to ten centimeters (3.9 inches) in length (Dumont 2004). The giant fairy shrimp (Branchinecta gigas) is found in the playas of California's southern deserts. This species traps the much smaller alkali fairy shrimp (Branchinecta mackini) with its large antennae. In contrast, the newly-discovered giant fairy shrimp Branchinecta raptor from Idaho has modified raptorial phyllopodia, which it uses to stab and puncture its prey. The body of a fairy shrimp is distinctly separated into head, thorax, and abdomen. The head consists of two sections: the first one with the antennae and eyes, and the second one bearing the jaws (mandibles and maxillae). The first pair of antennae, known as antennules, are usually of considerable length, but not segmented. The second pair, however, is more muscular, especially in males. The males use their antennae to grasp females while mating. In some males these antennae are equipped with numerous outgrowths and are quite unusual in shape. At the sides of the head is a pair of stalked compound eyes and an unpaired naupliar eye at the top of the head. The mandibles are strong but bear no palps, and the maxillae are primitive in structure. In front of the mandibles is a hoodlike upper lip, which hinders the flow of water towards the mouth. 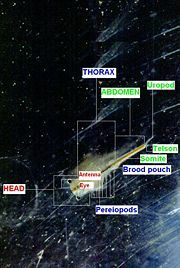 In most fairy shrimps, the thorax consists of 11 segments and a few have 17-19 thoracic segments. Every segment bears a pair of leaflike legs. They are all similar in structure, and every leg has two or three lobes on the outer side, which contain the breathing organs, and one lobe for paddling. On the inner side are six lobes that push the water to the mouth opening. On the ventral side of the body is a deep groove inside which the water flows to the mouth. The abdomen is cylindrical and consists of eight segments and a telson plate. Members of the order Anostraca ("fairy shrimp") are the least specialized of the extant (living) branchiopods, lacking any carapace and with the limbs all similar and used for both swimming and feeding (Russell-Hunter 1969). Members of Anostraca are found on all continents, including being found in Antarctica, and in Arctic environments as well. Although they live in fresh or saltwater, they do not live in oceans or seas. Fairy shrimp often appear in vernal pools, pot holes, and other ephemeral pools. They are well-adapted to living in arid areas where water is present for only part of the year. Their eggs will survive drought for several years and hatch about 30 hours after rains fill the pools where they live. Some eggs may not hatch until going through several wet/dry cycles, ensuring the animals' survival through times that the pools don't last long enough for the shrimp to reproduce. In the Arctic and Antarctic, the life cycle of fairy shrimp is regulated by alternation between freezing and thawing, not between wetting and drying (Dumont 2004). The Western United States (especially California) is home to many species of fairy shrimp, five of which are threatened or endangered: the vernal pool fairy shrimp (Branchinecta lynchi, threatened), the Conservancy fairy shrimp (Branchinecta conservatio, endangered), the San Diego fairy shrimp (Branchinecta sandiegonensis, endangered), the longhorn fairy shrimp (Branchinecta longiantenna, endangered), and the Riverside fairy shrimp (Streptocephalus wootoni, endangered). All these listed species are endemic to the west coast, some found in fewer than a dozen populations in a very small area. The vernal pool fairy shrimp (Branchinecta lynchi) was thought to exist only in California until a population was discovered in the Agate Desert area of Oregon in 1998. Fairy shrimp generally are male and female and reproduction is oviparous (producing eggs), with the exception of some species in the Artemia genus (Dumont 2004). 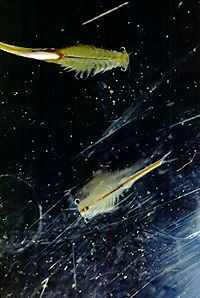 Some species of Artemia are viviparious (live birth) and some may reproduce via parthenogenesis. Generally there are marked differences between male and female, with males having the second antenna modified into a complex clasping organ for holding the female and males also have two penes (Dumont 2004). Although copulation and life cycles vary, with some copulations taking place so rapidly as to be hardly visible to the unaided eye and other cases lasting for hours (Dumont 2004), a typical process is as follows (Zenkevich 1968). During mating, the male swims under the female and grasps her with his antennae. He may hold on from seconds to several days, and then the crustaceans separate. Inside the female's body the eggs are wrapped in yolk and a strong shell that is, in certain species, equipped with spikes or bumps. The eggs are released by the female into her egg sac, two to three days after mating, but next are dumped into the water, where they start developing (Zenkevich 1968). The eggs of some species may sink to the bottom, while eggs of other species may float to the surface and drift to the lake shore to be deposited (Dumont 2004). Females can produce two types of eggs: thin shelled "summer" eggs, and thick shelled "winter" eggs. The type of egg produced is determined by the number of males in the community; summer eggs will be produced if there is a shortage of males in the population. Summer eggs hatch rapidly; the young form while still inside the brood sac. The young from these eggs will populate the pool during the same season they are laid. The winter eggs remain in the mud at the base of the pool and dry out with the pool. The eggs will hatch in the spring when the pools refills. Though the resting period usually varies between six to ten months, eggs have been hatched in a laboratory after 15 years. Eggs have been subjected to temperatures of as high as 99°C and as low as -190°C and remained viable. Winter eggs usually hatch 30 hours after being exposed to water (Zenkevich 1968). A female may lay up to forty batches of eggs in her lifetime, with each batch, or clutch, containing several hundred eggs, yielding a total fertility of up to 4,000 eggs per female (Dumont 2004). Dumont, H. J. 2004. Anostraca. In B. Grzimek, S. F. Craig, D. A. Thoney, N. Schlager, and M. Hutchins. Grzimek's Animal Life Encyclopedia, 2nd edition. Detroit, MI: Thomson/Gale. ISBN 0787657786. Follo, J., and D. Fautin. 2001. Branchiopoda Animal Diversity Web (online). Retrieved May 26, 2008. Hobbs, H. H. 2003. Crustacea In Encyclopedia of Caves and Karst Science. Routledge. Retrieved December 5, 2006. Myers, P., R. Espinosa, C. S. Parr, T. Jones, G. S. Hammond, and T. A. Dewey. 2008a. Class Branchiopoda (branchiopods) The Animal Diversity Web (online). Retrieved May 26, 2008. Myers, P., R. Espinosa, C. S. Parr, T. Jones, G. S. Hammond, and T. A. Dewey. 2008b. Order Anostraca The Animal Diversity Web (online). Retrieved May 26, 2008. Russell-Hunter, W. D. A Biology of Higher Invertebrates. London: Macmillan Company, 1969. Zenkevich, L. A. 1968. Zhiznʹ zhivotnykh (The Animal Life), Volume 2, Chapter 7 (Phylum Arthropoda). Moskva: "Prosveshchenie." OCLC 13589037. This page was last modified on 1 June 2008, at 17:33.